Daystar YJ 1.25" lift shackles, REAR. Daystar's background is rooted in unique off-road products, and our line of Super Shackles is another example of products designed with the off-roader in mind. Available in both greasable and non-greasable versions, Daystar Super Shackles can handle anything you care to throw at them. Constructed of heavy-duty plate steel, they include a fully welded center bar that reduces deflection and axle shift while cornering or when the suspension is articulating. There are stock replacement versions as well as versions that provide up to 2-1/2" of lift; check the product description to see what's available for your application. Shackles are sold in pairs. 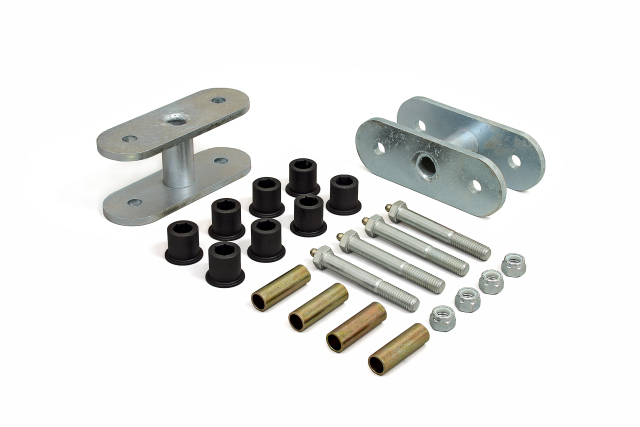 Greasable Super Shackles include replacement bushings, sleeves, and gun-drilled bolts with an easy-to-access grease zerk for servicing. Non-greasable versions retain the factory bushings and do not include hardware. Both versions come in a durable zinc-plated finish. Both shackle versions are sold in pairs.